Rep. Mark Sanford, R-S.C., talks about his time as the Governor of South Carolina, Richard Branson and water sports with his sons in this week&apos;s Take 5. 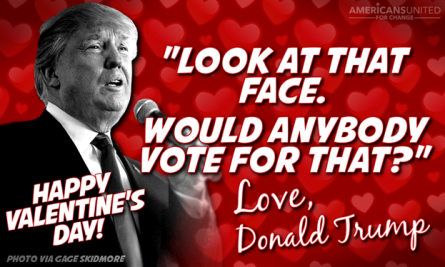 A progressive advocacy group is providing Valentines for every anti-conservative American out there this year. In a email on Friday, Democrat advocate Brad Woodhouse’s group, Americans United for Change, introduced its Valentine’s Day cards. In November, Ohio Gov. John Kasich asked a woman in Iowa if she has ever dieted in an effort to explain the work he has done for his state’s budget. In a September interview with Rolling Stone magazine, business mogul Donald Trump mocked Carly Fiorina’s appearance. D.C. residents supporting Sen. Bernard Sanders, I-Vt., in the New Hampshire Caucus will meet Tuesday night at Marx Café Revolutionary Cuisine, appropriate enough for a campaign that bills itself as a political revolution. The “Bernie Sanders New Hampshire Victory Party ” gets under way at the Columbia Heights haunt at 7 p.m. "Wear your Bernie gear, get pumped up, and prepare to fall in love again!" the notice from Bernie Sanders for President says. In the invitation, organizers also ask Sanders supporters to call people in Nevada and South Carolina, home to the next two presidential contests, to encourage votes for their man. Phone banking centers are located at American University and in Arlington and McLean, Va., this weekend.